I am a stocky, sturdy, compact little bundle of energy that was originally bred to catch and kill vermin, and I am legendary in my homeland for my courage and determination. My medium- length coat is harsh and comes in blue or wheaten. My size and hardiness make me a good choice for home or apartment life. When fully grown, I am about 14 inches tall (35.6 centimeters). 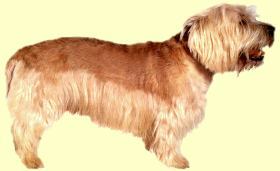 We have no Glen of Imaal Terrier Breeders listed at this time. Click here to place your Glen of Imaal Terrier Ad!